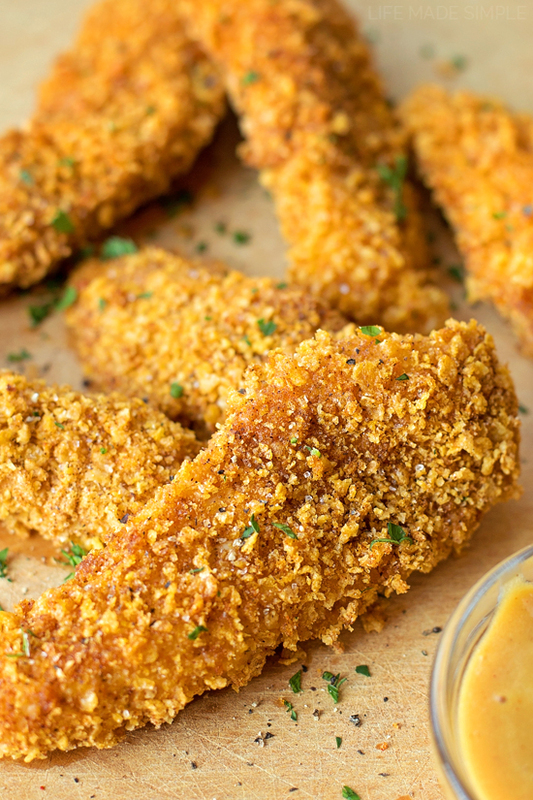 These crispy cornflake chicken tenders are coated in cornflake crumbs and baked to perfection. They’re a breeze to make and will be gone in seconds! Our family LOVES chicken. I’m sure you’ve probably figured that out by now just by browsing through the recipe index. We probably eat it 5 times a week, which means I’m constantly trying new recipes just to switch things up a bit. Our toddler especially, always loves when I make chicken nuggets or chicken strips, so I when I came across a recipe using cornflakes as the crust, I knew it was going to be a hit! First, you’ll start by cutting the chicken breasts into strips, then tossing them into a large ziploc bag or a container with a lid. I like to pour a generous amount of buttermilk over top, then season them a bit with salt, pepper, paprika and dried parsley. 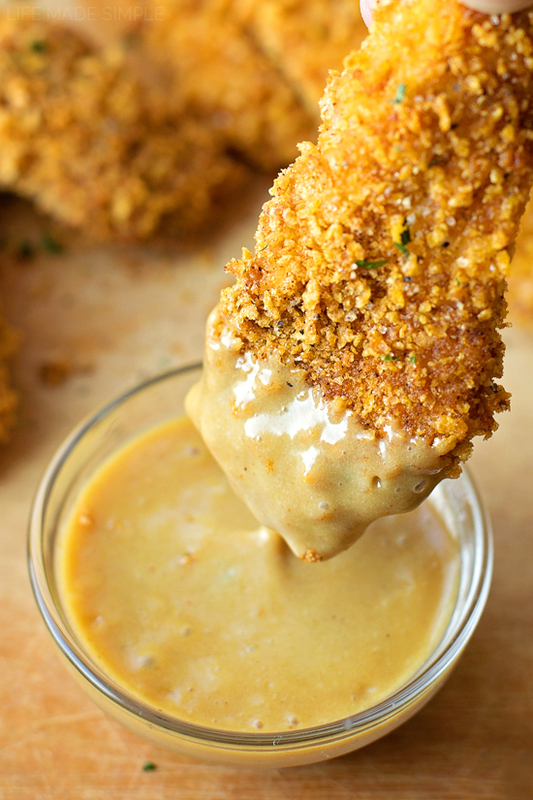 Toss it in the refrigerator for 25 minutes, then remove it while you whip up the breading. 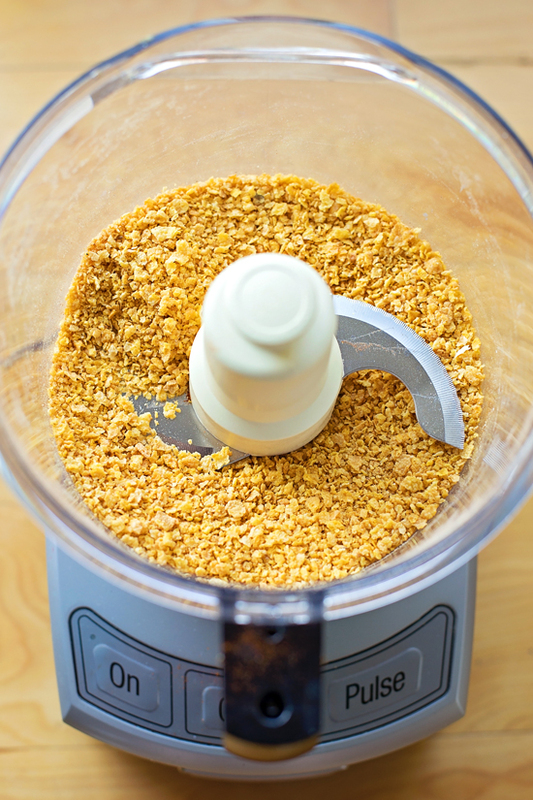 For the breading, you’re going to grind the cornflakes into panko-like crumbs. We prefer extra crunchy chicken tenders, so I like to leave them on the coarser side (like in the picture above). Just know that underneath all of those flakes, you’ll have teeny little crumbs, so don’t pulse them too much. Pour the mixture into a shallow dish and season with paprika, garlic powder, onion powder, sugar, salt and pepper. Place one strip at a time into the breading, press to coat. Set the strips on a lined baking sheet and spray lightly with cooking spray. I generally use sunflower, avocado, or grapeseed oil, all of which have high smoke points. Both Spectrum and La Tourangelle carry these products, you can find them in well-stocked grocery stores and online. Place in the oven and bake for 12-14 minutes at 400 degrees. Meanwhile, you can whip up your own honey mustard sauce, or grab a bottle of BBQ sauce for dipping! When they’re extra golden on the outside and reach an internal temperature of 160 degrees, pull them out of the oven and let them rest for 3-4 minutes before serving them. Like I mentioned above, we dipped ours in honey mustard and BBQ sauce, they were devoured in no time! 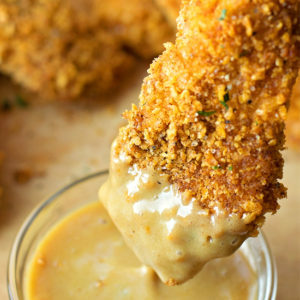 We’ll definitely be making these again, possibly into little nuggets, because who can resist bite-size finger food?! 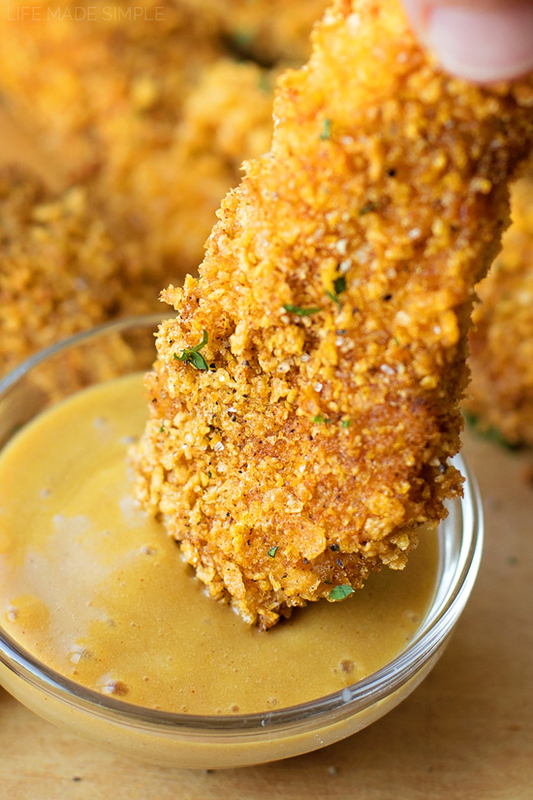 These crispy cornflake chicken tenders are coated in cornflake crumbs and baked to perfection. They're a breeze to make and will be gone in seconds! Place the chicken strips into a large ziploc bag or a container with a lid. Pour the buttermilk over top, then season with ¼ teaspoon paprika, ¼ teaspoon kosher sea salt, ¼ teaspoon ground black pepper, and the parsley. 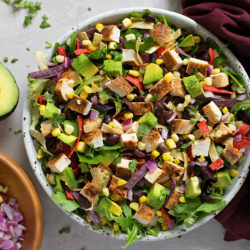 Zip or cover and place in the refrigerator to marinate for 25 minutes (up to 2 hours), then remove it and let it sit at room temperature while preparing the breading. Preheat oven to 400 degrees. Line a baking sheet with a silicone baking make or foil; set aside. For the breading, pulse the cornflakes into panko-like (slightly larger) crumbs. We prefer extra crunchy chicken tenders, so I like to leave them on the coarser side (like in the picture above). Pour the crumbs into a shallow dish and season with the remaining paprika, salt, pepper, parsley, sugar, garlic powder, and onion powder. Place one strip at a time into the breading, press to coat. Set the strips on the prepared baking sheet and spray lightly with cooking spray. Place in the oven and bake for 12-14 minutes or until they reach an internal temperature of 160 degrees. 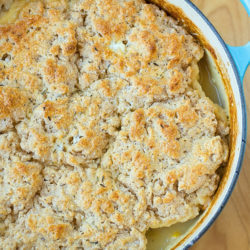 Remove from the oven and allow to rest for 3-4 minutes before serving. 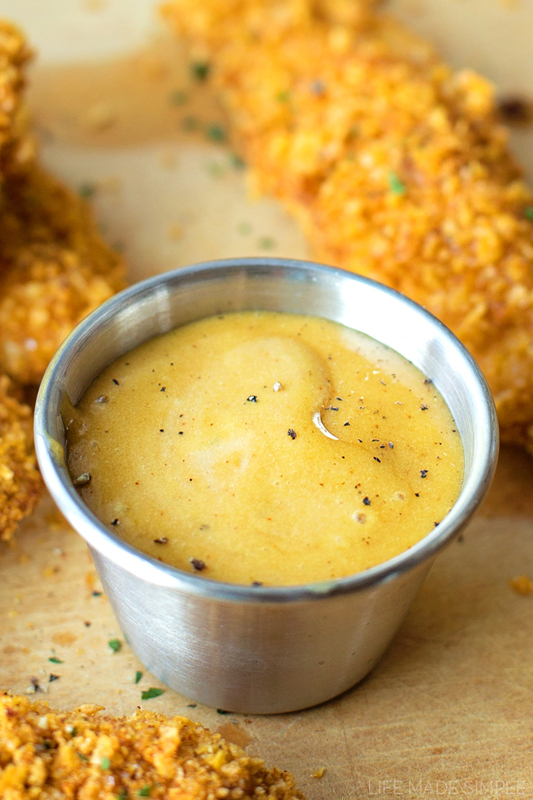 For the honey mustard, whisk all of the ingredients in a mixing bowl. 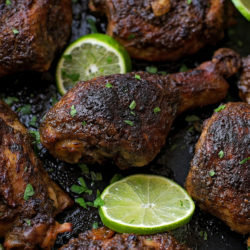 -Use a high smoke point oil when baking at temperatures of 400+ degrees. This was super easy and very tasty! I didn’t measure the spices, so I know I used a bit more, but it was excellent! Can the chicken tenders be made in advance and get refrigerated after frying them? Yes, but I’d suggest reheating them in an oven so that they get nice and crisp again. Thanks a million for the tip. I am planning my son’s birthday party and I wanna make them in advance along with the honey corn dogs. Thank you so, so much!!!!!! These were easy and very tasty! Toddler and adult approved. I made them in a rush, so I could only marinate for about 25 minutes. Flavor was still good. Thank you! Where do you add the sugar? I did not see sugar in the directions. Yeah what did you do? You just got me overcome my PMS, plus made my husband and two preschoolers extremely happy. Oh, and the sauce! Thank you !! ( I just crushed the corn flakes manually, leaving some bigger bits; I also put a spoonful of mayonnaise into the marinade- you just have to add some mayo at one point when you live in Belgium, right?). Do we discard the marinade? Do you have to bake at 400° for 14 minutes or can i do 375° for 25 minutes? I apologize, somehow that didn’t make it into the method. I just updated it! Thanks for catching that Lisa.